CM Manufacturing increases production and gets peace of mind with a new File Management System. This newsletter is being sent to CNC users as a free service to keep you up-to-date on some of the latest technology and how to get more done in less time and effort. If this has reached you in error or you are not the correct person, email us back at info@themazatroladvantage.com and let us know who the correct contact is. “How I am going to get this file management working smoothly with my Fusion and Matrix controls? We’re wasting way too much time and effort trying to organize our Mazatrol programs and there is no light at the end of the tunnel.” That was the state of mind Sandy found himself in as he arrived at work every day. The company Sandy works for, CM Manufacturing in Missoula, Montana, is not your typical job shop: bidding on contracts as much as doing repeat jobs. Most of CMs contracts are government-related, which require different levels of delivery. Often, the contract calls for a first article for testing and approval, and then parts are bought off at different stages. CM Manufacturing mostly makes proprietary landing-gear parts for military aircraft. With four Mazak lathes and three Fadal machines, CM’s machinists pride themselves in doing hard turning and hard milling. This process requires removing metal from 300-M steel, heat-treating it and then hard cutting the metal to within 0.0005 tolerances. As the shop continues to increase production, getting more contracts and making more programs, the CNC machine's controls fill to overflowing with programs that are going to be needed in the future. These programs need to be stored off the controls in a safe and easy-to-manage system. 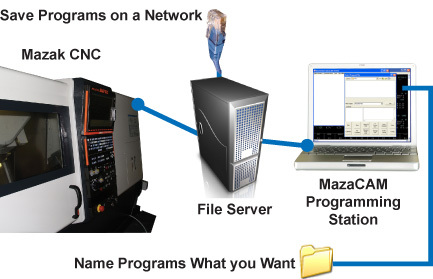 Mazaks offer several ways to save programs — such as Fusion Floppy, Matrix USB, RS232 on Fusion, and Networking to a server on both Fusion and Matrix controls. During a training session at Mazak Corporation one of the programmers for CM Manufacturing discovered that their Mazak machines could be connected to the Network thus giving them the solution they were looking for. Although this looked like the light at the end of the tunnel, it turned out to be the legendary “train coming the other way” — a bigger problem — because they found that in order to save these programs, they would need to give them long, unwieldy file-name paths and they would still have no really easy way to manage the programs at the computer. Sandy decided to do more homework to better identify the exact problem and research how to solve this issue. He knew that he needed to easily save programs from the Mazak to the server without having to use long folder name paths every time he wanted to save or retrieve a program. He also knew that he needed to take the programs from the server to a “Proven Parts Folder”. These files (originally saved as a four-digit number) had to be stored in an easily identified folder and easy-to-identify name and number. With the help of one of his peers, Sandy found that there are several software solutions available that help with such scenarios. But software is not all he needed. Sandy is not a computer guy. He is not well versed in the computer field and he doesn’t really want to be. He just wants to get the job done, so it was important to find a company that would give him more than just software — he needed easy-to-use software and just as importantly he needed the help to make the whole system easy for him to understand and use. Sandy spoke with one of the applications engineers at SolutionWare Corporation. This is where things began to take shape and truly showed him the light at the end of the tunnel. The SolutionWare applications engineer explained how the Mazak controls function and what their capabilities are. He also showed how SolutionWare’s MazaCAM Editor & Utilities support Mazaks in the Mazatrol language and interacts in a smoothly integrated and friendly way. Sandy realized he finally had a real solution. MazaCAM enables the user to take the files stored in the server and identify the program ID as well as the number. From there, functions can be created so that a couple of icons can transfer programs from the server (without bothering the user with the lengthy path) to new folders that are automatically generated as needed. The Mazatrol programs can be viewed on a PC in Sandy’s office, and can be easily identified, transferred, and modified. This method of storing programs makes it easy so that your average-Joe can file and retrieve those valuable programs that are one of the assets of CM Manufacturing. Sandy is now using his new-found solution every day. “The biggest thing MazaCAM did for me was to make it easy to put part number names on folders, storing my files within those folders and a Mazatrol Editor to help modify my programs.” Problem solved. CM Manufacturing has now entered a new era in the way they do things at their shop. Bottom line: software is valuable as long as it makes things better and easier in one’s life. MazaCAM did just that for Sandy and company. One of the big production bottlenecks for many shops is the time it takes to set up the machine for the job. While set-up is a necessary action for any job, there are some things one can do to reduce the amount of time it takes, and thus get more jobs done in less time, and cut delivery times. If your machine is not cutting parts right now, you are not making money right now! Copyright © 2010 by SolutionWare Corporation. All rights reserved.